being scared of baking from scratch (i’m almost over my fear! ), and being the nerd that i am, i spent a good amount of time researching different techniques to make sure cookies come out perfect. i think they helped 🙂 i’ll share those tips with you as well. you can find the original recipe here. i’ll write out my adaptation at the bottom of this post. my cookies were VERY sweet. if you don’t like them so sweet, try the original recipe, it might be less sweet. oh PS… this is my mom’s kitchen 🙂 so the lighting is better and she has cute hot pink mixing bowls. adorable! 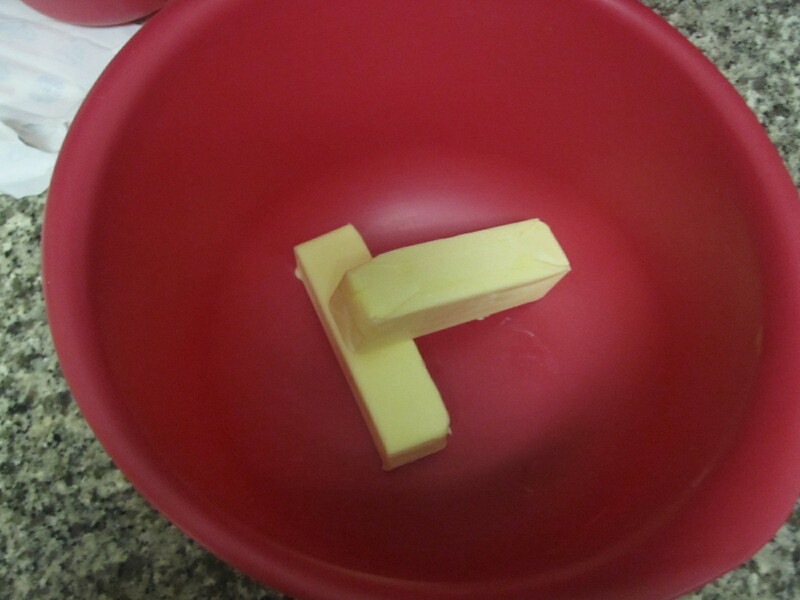 start off with 2 sticks of butter. plan ahead and let these come to room temperature. 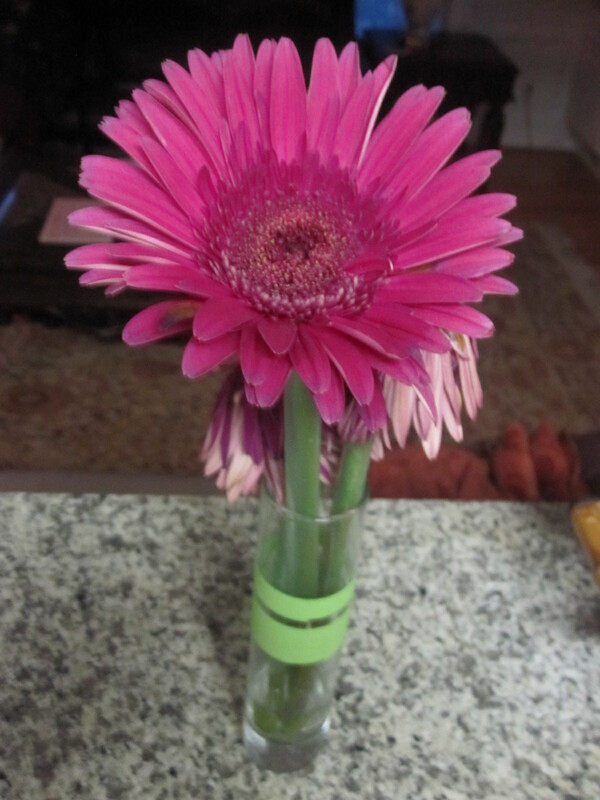 they should be softened, but not melted. do not try to use melted butter instead! the butter should be soft enough to cream and shouldn’t crumble when you push it with your finger. it takes a while to come to room temp. sift together 2 1/4 cups flour, 1 teaspoon baking soda and 1 teaspoon salt in a seperate bowl. which i had to take a pic of 🙂 and also some homemade vanilla extract! 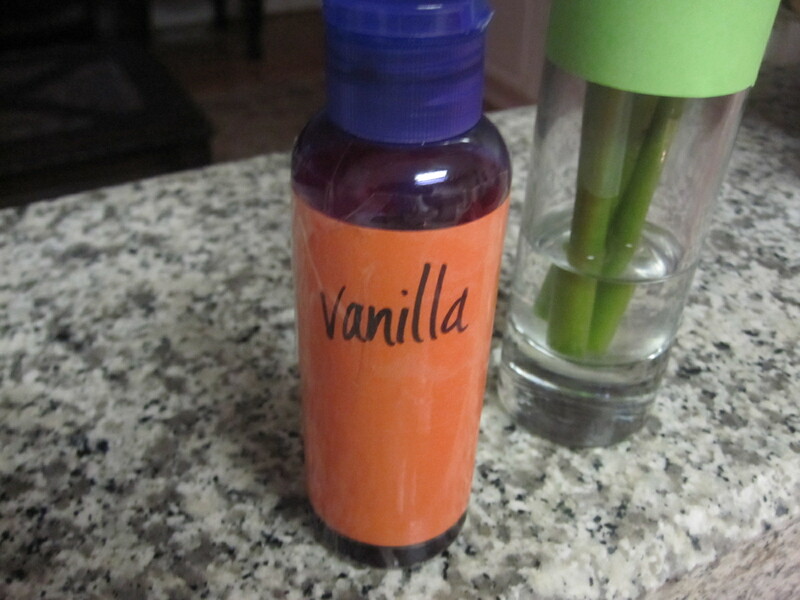 can you believe someone actually MAKES vanilla extract from scratch? props! anyways back to the cookies. after you’re sure that your butter is soft, add in the the sugars and vanilla extract and beat with a spoon until creamy. this is where i messed up. instead of using 3/4 cup brown and 3/4 cup white sugars, i used 1 cup brown and a little less than 2/3 cup white sugar. i used the 1/3 measuring cup instead of the 1/4. see? bad at baking. i also added 1 1/4 teaspoons (instead of 1 teaspoon) of vanilla extract. just for kicks. 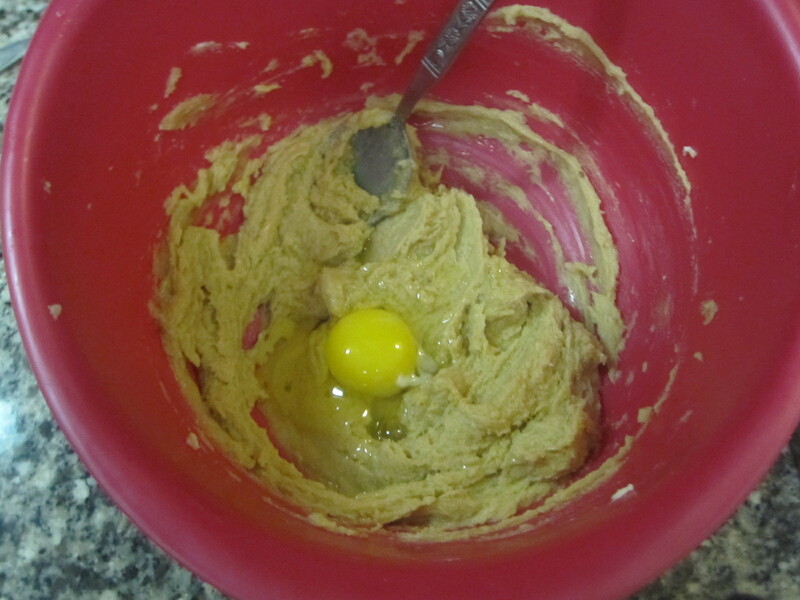 then add an egg, mix until incorporated, then add the other egg, and mix until incorporated. 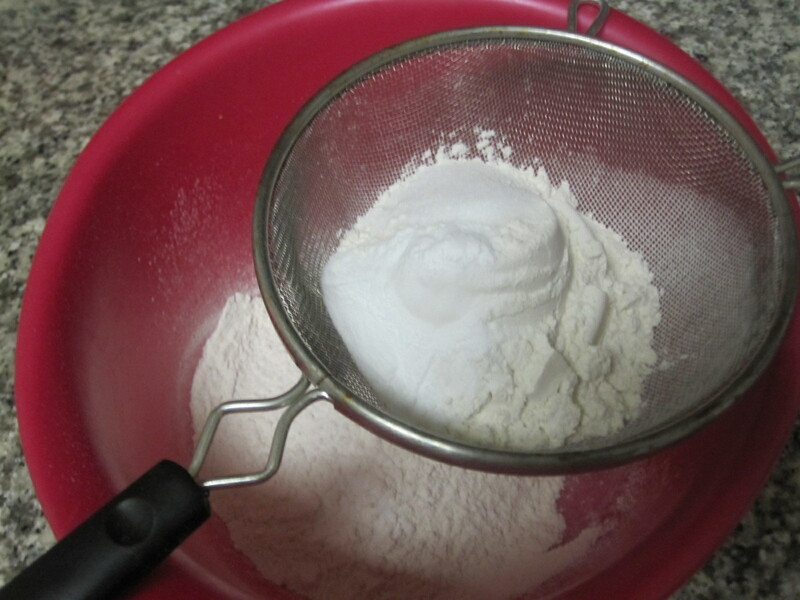 then gradually add the flour while mixing. do not overmix. then add 2 cups (1 bag) semi-sweet chocolate chips. 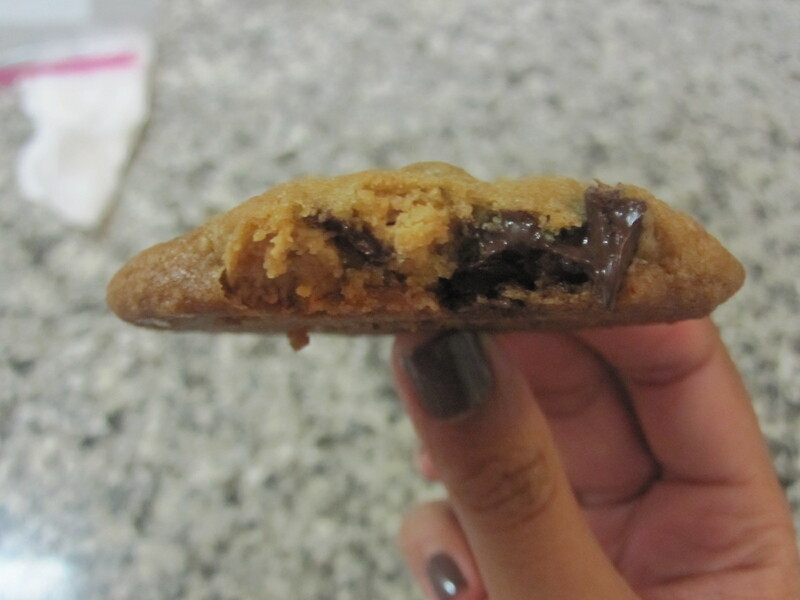 any quality will do… i got harris teeter brand because it was on sale, and the cookies were still delicious. more expensive isn’t ALWAYS better 😉 i also added about 1/4 cup of peanut butter chips and about 1/2 cup toffee pieces because i had them on hand. 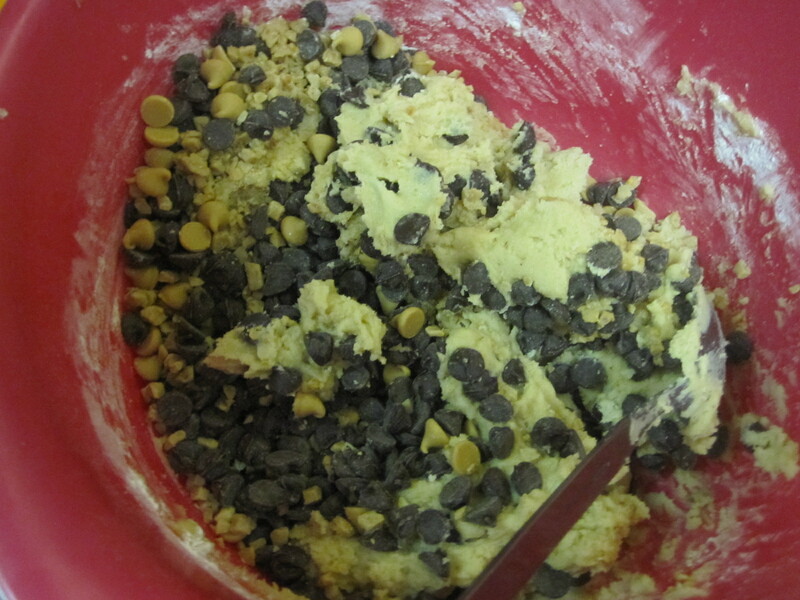 the original recipe calls for 2 cups chocolate chips and 1 cup nuts. i say use that 1 cup of nuts as 1 cup of whatever-candy-pieces-you-have-in-the-pantry. 🙂 make those cookies YOURS! 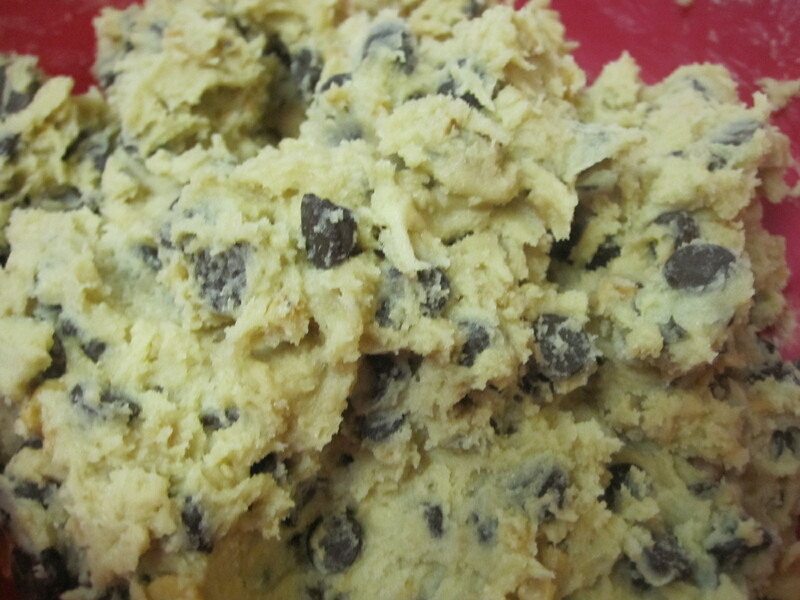 stir up a bit, then you have your own homemade cookie dough! now – cover and CHILL for 30 min – up to a day. this allows the dough to completely soak up the eggs. gives it a nice consistency 🙂 the chilling also keeps the cookies more intact while baking. i made one batch that had been sitting on the counter for 20 minutes and another that was in the fridge for 20 minutes, and the chips sank in the batch that had been sitting out. always try to keep your pans and dough chilled. 1 batch at a time, pop them into a 350 degree oven for exactly 10 minutes. 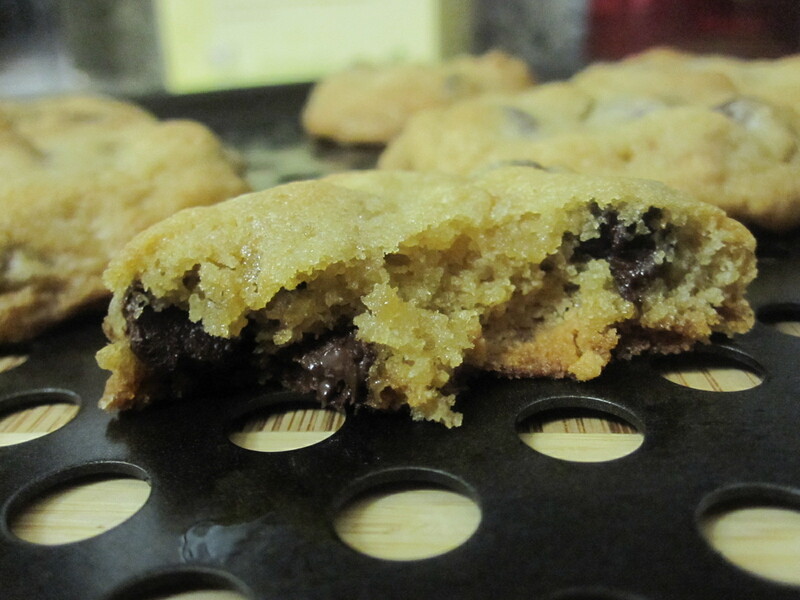 they will seem slightly underbaked, but after experimenting, this makes for the PERFECT consistency. to me, at least. 🙂 the original recipe asks for 375, i lowered it a bit to make them softer. makes… a lot of cookies. once butter is soft, mix in sugars and vanilla until creamy. 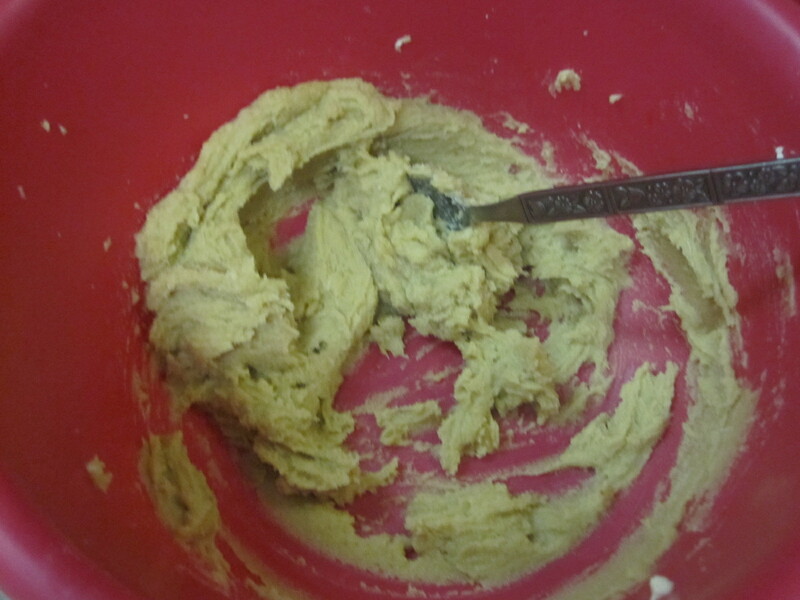 add eggs, one at a time, to the butter and sugar mixture. mix well after each addition. 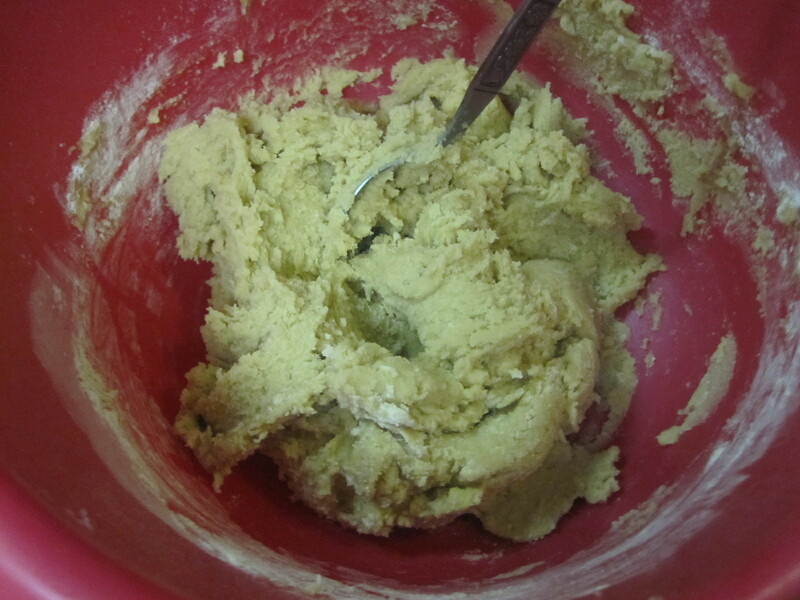 gradually add the flour, being careful not to overmix. stir in chocolate chips, PB chips and toffee chips. 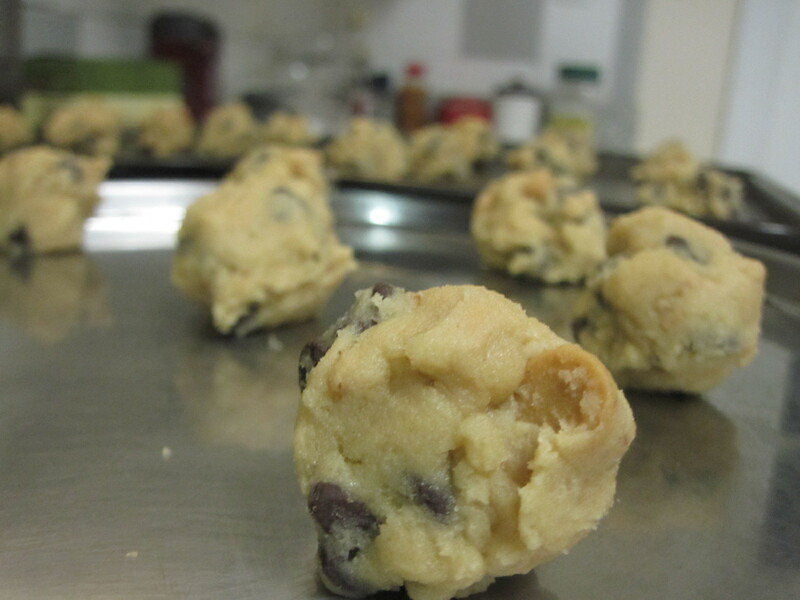 make small cookie balls and spread evenly on cookie sheet. you will need to make several batches. bake each batch seperately for 10 minutes each. allow to cool before removing from sheets. make sure that each cookie sheet is cooled completely before loading it up with another batch. omg they look so goood.. im hungry now! DELISH. I had, like, 2. Ok maybe 4… sigh. i guess you are saving my batch for when i move there. as a welcome gift and a thank you gift?? ?